The City of Orlando’s Recreation Division offers a wide array of programs throughout the year for youth. 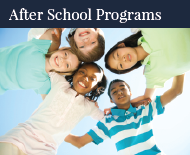 Academic enrichment programs are hosted by the community centers and After School All Stars, providing tutoring and educational lessons focusing on the core areas of reading, math and science. School Vacation Days Camp is available during Orange County Public Schools holidays and breaks. A safe and affordable Summer Camp Program is designed for youth to participate in recreational activities throughout the summer months. The mission of Parramore Kidz Zone is to equip Parramore children with education and development programs to become successful, healthy adults.